Our pregnant dames are in our master bedroom. Their pups are born here and stay here with their Mom until they are 4 weeks old. I can be on hand all the time. I see each pup born no matter the time labor starts or how long it goes. I take each pup out of their birth sack and I cut the cords so we never have a pup with a hernia. I ensure each pup nurses as soon as they can. Right from birth I'm very hands on with each pup. Every week I work more and more with the pups. Earning their trust by gentle touching their paws, ears, opening their mouths, placing them on their backs. They eat their first solid meals right from my hand. Showing that humans provide them their food. Once 4 weeks old the litter is moved to a 4' x 6' puppy pen in our dog room attached to our house. Here I have 3 seperate pens that have solid walls to make my dames feel secure and they have privacy. I can divide each pen in half so the pups can stay on one side and Mom can get to her blankets, food and water on the other side. My dames are able to get away from their babies so they do not have to be nursing 24/7. I take the pups outside with Mom starting at 5 1/2 weeks old (as long as the weather permits) for the start of house training and playtime. They are given praise for releaving themselves outside. If I have more then 1 litter around the same age then I also start socializing the pups. I do not allow pups to climb all over me they are picked up and calm and placed on my lap for cuddle time. I do not play tug of war with the pups. I also watch for rough play at all times. No pup here is allowed to push their weight around, I'll always step in as top dog to all. At 6 weeks of age the inside pen is now just for the pups mainly. The pen has a divider they can climb over to relieve themselves on shaving. The other side is the sleeping and play area. Blankets and toys are removed and replaced as needed to ensure their sleep area is clean. Food and water is given here at certain times during the day when outside eating can not be done. Mom comes to see them about 4 times a day. At 7 weeks old Mom see's them outside only and they are about 95% weaned. 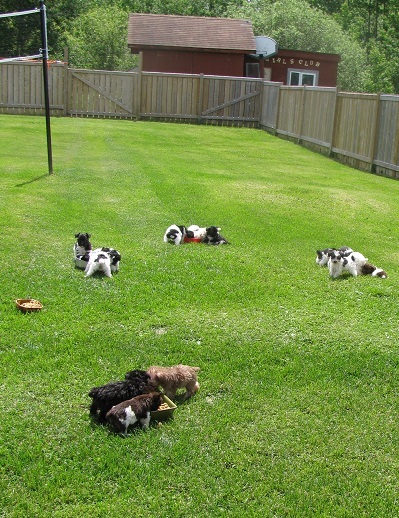 Below is a picture of the pups in our fenced backyard. These are the days I love because I can really see how happy our babies are. Lunch is often given outside. Our fence is secure and goes right to the ground. No dogs are allowed in our backyard except our own. I pick up after the pups and our dogs almost constantly, the backyard is also our family area so it must be kept clean. Below is a picture of one of our 7 week old babies. They learn to trust so much that I can place them on their backs in water and they do not struggle. Water training is done slowly and at their own pace so they do not become fearful. Most love water but some never like it no matter how slow I go. Like people, pups are not made from cookie cutters and each is their own being. The pups are feed 3 times a day. Once they are 6 1/2 weeks old it is cut back to twice a day. I always make sure they see I'm placing the food down. This makes the pups learn that they depend on me. Everything I do is to establish that humans are the pack leaders. confident, loving, alert pups. They leave here wanting you to be the leader and expect that you will keep them safe. All pups/dogs want to be safe. If you baby and spoil your pup and allow them to do what they want because they are small, young and cute then you will take away all the learning we have taught them here. Our dogs are all on Actrium Holistic Dog food and we put our pups on the Puppy Actrium Holistic at 4 weeks old. This dog/puppy food is wheat and corn free and our dogs do great on it. I do not get anything from telling families about the food we use. I just know it works for us and I hope it does for you too. If you do not use the food we use then do your research and remember that more expensive doesn't always mean better. 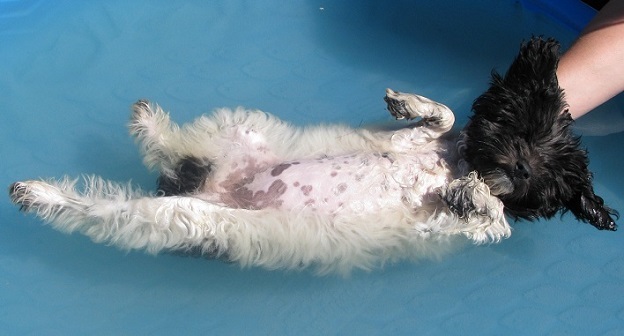 Too cheap and it does nothing for your dog, too rich can cause skin issues in this breed. We do plan to feed our dogs what we grow in the near future. Enough puppy food for 3-4 days. A special blanket and toy that carries the parents smell to help ease your pup while adjusting to their new homes. Please place the blanket over the outside of the kennel so your pup doesn't accidently soil it. This will make the blanket last a few weeks before it needs to be washed. You can place the toy inside the kennel to comfort your pup. Revolution is the dewormer our dogs and pups are on. This is also a heartworm prevention medication keeping our dogs and their babies free from heartworms which can become fatal. 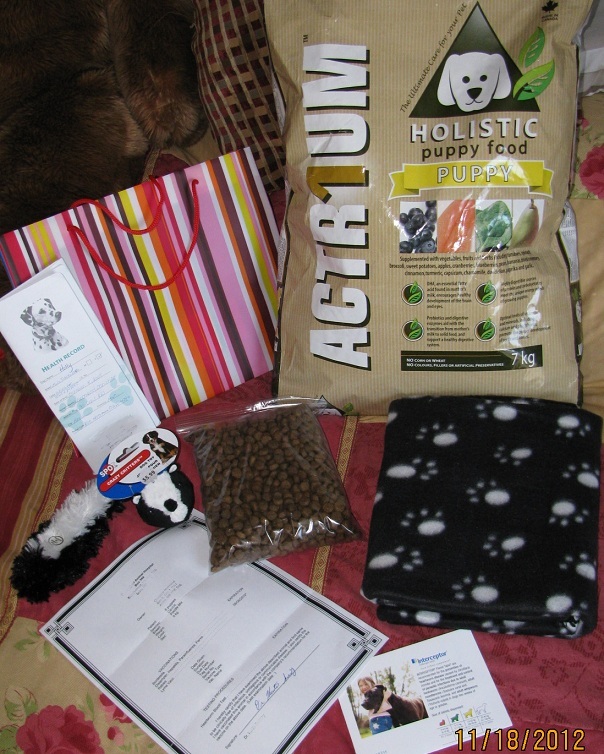 Pictured below is what you get with our pups. Pups flying to their new homes may not get as much food. We do provide everyone with their pups original vet folders. Everything done to our pups plus feeding routine is written in the folder. If you are having your pup flown to you then it is your responsiblity to make sure the airline gives you your pups folder. They can not board a flight without their vet folders.